They're lovely! Still girly but not sugar coated like they would over a pink base :) Honestly, I prefer this take at it! I'm in a lazy mood recently I guess, I've been enjoying plain manis quite a lot lately... Go figure! What a wonderful manicure! 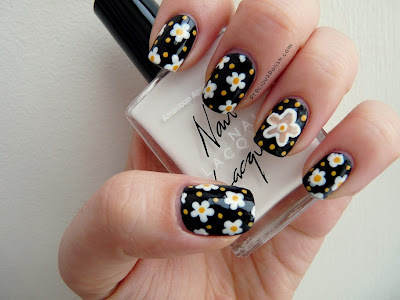 I like the black background combined with the white daisies!